Midtøstens litteraturer (MØNA1300) og Prosjektbeskrivelse for afrikanske og asiatiske studier (KOS 4000). Prosjektet "Det tyrkiske talespråket på 17- og 1800-tallet: Tyrkiske transkripsjonstekster" (pdf), som tar utgangspunkt i forskjellige Karmanlidiske tekster (tekster på tyrkisk med greske bokstaver fra slutten av det 1700-tallet). The Brill Encyclopedia of Turkic Languages and Linguistics, hvor jeg har det redaksjonelle ansvaret for anatolske dialekter. Prosjektet "En tyrkisk deltaker på den norsk-svenske orientalistkongressen i 1889" (pdf) ser nærmere på reisebeskrivelsen Avrupa'da bir Cevelan (Istanbul 1890) av den tyrkiske forfatteren Ahmed Midhat (1844–1912) som inneholder interessante inntrykk fra Stockholm, Uppsala og Christiania.Nå avsluttet, se bibliografien nedenfor. Opprykk til professor ved UiO 2002. 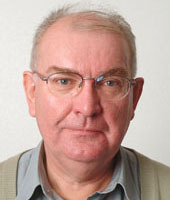 Vikariat som professor i turkolog ved universitetet i Mainz April 2001 – Apri 2002. Dr. philos. 2001 på avhandlingen The Turkish Dialects of Trabzon. Their Phonology and Historical Development. Studieopphold i Chicago hele 1993. Midlertidige ansettelser i professorater i Frankfurt (1991) og Mainz (2001/2002). Opprykk til førsteamanuensis i 1989. Ansatt som amanuensis i tyrkisk i 1982. Dialektologisk feltarbeid i Trabzon ved Svartehavsysten i Tyrkia 1978/79. Studieopphold i Kairo høsten 1977. Magistergrad i tyrkisk språkvitenskap ved UiO 1977. Tyrkiskstudier ved Istanbul-universitetet 1974-1976 og ved UiO 1976-1977. Gresk (1969) og latin (1973) mellomfag ved UiO. Født i Oslo i 1949. Pris for Superior Service to Turcology fra Istanbul-universitetet i 1985. Det tyrkiske utenriksdepartementets fortjenestemedalje for innsats for tyrkiske studier i 2010. Styremedlem i Instituttet for sammenlignende kulturforskning. The Turkish language reform and language policy in Turkey. In: Hazai, György (ed. ): Handbuch der türkischen Sprachwissenschaft, Teil I (Budapest: Akadémiai Kiadó 1990), p. 454-493. Laz influence on Black Sea Turkish dialects ? In: Brendemoen, Bernt (ed. ): Altaica Osloensia – Proceedings from the 32nd meeting of the Permanent International Altaistic Conference (Oslo, June 12-16, 1989) (Oslo: Universitetsforlaget 1990), p. 49-64. (Sammen med E. Hovdhaugen:) Tyrkisk grammatikk. Oslo: Universitetsforlaget 1992 og senere. 218 s.
Some remarks on the vowel harmony in a religious dialect text from Trabzon. In: Bethlenfalvy, Géza et alii (eds. ): Altaic religious beliefs and practices – proceedings of the 33rd meeting of the PIAC (Budapest, June 24-29, 1990) (Budapest: Research group for Altaic studies 1992), p. 41-57. Pronominalsyntax in den türkischen Schwarzmeerdialekten — syntaktische Innovation oder Archaismus ? I: Laut, Jens Peter & Röhrborn, Klaus (eds. ): Sprach- und Kulturkontakte der türkischen Völker — Materialien der zweiten deutschen Turkologen-Konferenz (Rauischholzhausen, 13.-16. Juli 1990) (= Veröffentlichungen der Societas Uralo-Altaica Bd. 37.) (Wiesbaden: Harrassowitz 1993), s. 51-73. Orhan Pamuk og hans Svarte Bok. I: Svenska Forskningsinstitutet i Istanbul — Meddelanden 18, 1993, s. 21-60. Imâle in der osmanischen und tschagataischen Dichtung. I: Johanson, Lars & Utas, Bo (eds. ): Arabic prosody and its applications in Muslim poetry. (= Swedish Research Institute in Istanbul - Transactions vol. 5) (Stockholm 1994), p. 17-34. Case merge in the Black Sea dialects — A Kartvelian substrate feature ? I: Berta, Árpád & Brendemoen, Bernt & Schönig, Claus (eds. ): Symbolae Turcologicae — Studies in honour of Lars Johanson (= Swedish Research Institute in Istanbul - Transactions vol. 6) (Stockholm: 1996), s. 41-59. Some remarks on the copula in a “micro-dialect” on the Eastern Black Sea Coast. In: Zeitschrift für Balkanologie 33, 1997, p. 2-8. Einige Bemerkungen über die Wortstellung in anatolischen Dialekten. I: Demir, Nurettin & Taube, Erika (eds. ): Turkologie heute — Tradition und Perspektive. Materialien der 3. Deutschen Turkologen-Konferenz Leipzig, 4.-7. Oktober 1994. (= Veröffentlichungen der Societas Uralo-Altaica Bd. 48) (Wiesbaden: Harrassowitz 1998), s. 27-46. Some remarks on the -mIs past in the Eastern Black Sea Coast dialects. I: Turkic Languages 1, 1997, s. 161-183. The chapters “Turkish Dialects” and “The Turkish Language Reform”. In: Johanson, Lars & Csató, Éva (eds. ): The Turkic Languages (London: Routledge 1998), p. 236-247. Greek and Turkish Language Encounters in Anatolia. I: Brendemoen, Bernt & Lanza, Elizabeth & Ryen, Else (eds. ): Language encounters across time and space (Oslo: Novus 1999), s. 353-378. The status of Anatolian dialectology at the turn of the XXth Century. In: Archivum Ottomanicum 18.2000.127-137. The Turkish Dialects of Trabzon. Their Phonology and Historical Development. Vol. I — Analysis (345 s.); vol. II — Texts (280 s.). Wiesbaden: Harrassowitz. 2002. “Tyrkisk”. In Gammelgaard, K, Mejdell, G. & Scarverud, R. (eds. ): Standardspråk underveis. Historien til åtte orientalske og østeuropeiske språk. Oslo: Unipub forlag. 2004. 63-80. Sentence subordination in the Turkish Eastern Black Sea dialect – another example of copying from Greek? I: Welo, Eirik & Haug, Dag (eds. ): Haptačahaptāitiš. Festschrift for Fridrik Thordarson (Oslo: Novus 2005), s. 29-47. Some remarks on the phonological status of Greek loanwords in Anatolian Turkish dialects. In: Csató, Éva Agnes, Isaksson, Bo, and Jahani, Carina (eds. ): Linguistic Convergence and Areal Diffusion. Routledge, 2005. s. 335–345. Ottoman or Iranian? An example of Turkic-Iranian language contact in East Anatolian dialects. In: Johanson, Lars & Bulut, Christiane: Turkic-Iranian Contact Areas [= Turcologica, 62] Wiesbaden: Harrassowitz 2006. p. 226-238. Aspects of Greek-Turkish language contact in Trabzon. In: Boeschoten, Hendrik & Johanson, Lars: Turkic languages in contact [= Turcologica 51]. Wiesbaden: Harrassowitz 2006. p. 63-73. Popüler Tartismada Hatalar ve Normlar [Errors and norms in popular discussion]. In: Menz, Astrid & Schroeder, Christoph (eds. ): Türkiye'de Dil Tartismalari. Istanbul: Istanbul Bilgi Universitesi 2007. s. 25-39. Objekter i romanen. Orhan Pamuk og den materielle verden. I: Materiell kultur & kulturens materialitet. Novus Forlag 2011. s. 81-97. (Together with H.S. Çorbacıoglu:)Tyrkisk–norsk ordbok. Türkçe-Norveççe Sözlük. Oslo: Sypress 2013. Some remarks on the infinitive in -mA in 17th century Ottoman Turkish. I: Turcology and Linguistics. Éva Ágnes Csató Festschrift. Ankara: Hacettepe Üniversitesi Yayınları 2014, s. 103-113. Orhan Pamuk and the material world. The author's use of objects in his novels. I: Hickman, Bill and Leiser, Gary (eds. ): Turkish Language, Literature, and History – Travelers' tales, sultans, and scholars since the eighth century. Routledge, 2016. s. 60–78. Brendemoen, Bernt (2017). En tyrkisk klassiker på norsk og engelsk. Babylon - Nordisk tidsskrift for Midtøstenstudier. ISSN 1503-5727. 15(1), s 64- 71 Fulltekst i vitenarkiv. Brendemoen, Bernt (2017). Pamuk en Scandinavie, I: Sophie Basch & Nilüfer Göle (red. ), Cahier Pamuk. Editions de L'Herne. ISBN 9782851971883. Kapittel. s 115 - 120 Fulltekst i vitenarkiv. Brendemoen, Bernt & Corbacioglu, Sinan (red.) (2013). Tyrkisk-norsk ordbok. Sypress forlag. ISBN 978-82-91224-55-8. 481 s.
The dialects spoken in Trabzon on the Eastern Black Sea Coast are the Anatolian dialects that have preserved the most archaic features. At the same time, they are the ones that display the greatest number of innovations, due to the influence of other languages in the region. The archaisms indicate that the first speakers of Turkish must have settled in the area more than a hundred years before the Ottoman conquest, i.e. in the 14th century, although historical sources give no information on Turkish settlements at that time. The main aim of this study is to analyze the Trabzon dialects synchronically and diachronically and to explain the features that distinguish them from other Anatolian dialects. The study also makes a hypothesis about the turkization of the area. The second volume contains dialect texts which constitute the material for the analyses in the first volume. These texts, which have been recorded and transcribed by the author, are provided with numerous footnotes, and give a unique impression of the folkloristic and historical richness of the region. The Turkish dialects spoken in the province of Trabzon on the Eastern Black Sea Coast are the Anatolian dialects that have preserved the most archaic features. At the same time, they are the ones that display the greatest number of innovations, due to the influence of other languages spoken in the region. The archaisms indicate that the first speakers of Turkish must have settled in this secluded area of Anatolia more than a hundred years before the Ottoman conquest, i.e. in the 14th century, although historical sources give no information on Turkish settlements in the area at that time. The main aim of this study is to analyze the Trabzon dialects synchronically and diachronically and to explain the features that distinguish them from other Anatolian dialects. The study also makes a hypothesis about the turkization of the area. The second volume contains dialect texts which constitute the material for the analyses in the first volume. These texts, which have been recorded and transcribed by the author, are provided with numerous footnotes and explanations, and give a unique impression of the folkloristic and historical richness and variety of the region. Brendemoen, Bernt; Lanza, Elizabeth & Ryen, Else (ed.) (1999). Language Encounters across time and space. Studies in language contact. Novus, Oslo. ISBN 82-7099-308-5. Brendemoen, Bernt; Hovdhaugen, Even & Magga, Ole Henrik (ed.) (1984). Riepmočála Essays in honour of Knut Bergsland. Novus Forlag. ISBN 82-7099-095-7. 222 s.
Brendemoen, Bernt (2018). The place of ‘The Museum of Innocence’ in the oeuvre of Orhan Pamuk. Brendemoen, Bernt (2017). Orhan Pamuk og Elena Ferrante — Tyrkia møter Italia. Brendemoen, Bernt (2017). Orhan Pamuks forfatterskap. Brendemoen, Bernt (2016). Noe fremmed i mitt sinn. Brendemoen, Bernt (2016). Pamuk på tyrkisk og i oversettelse. Brendemoen, Bernt (2015). Black Sea Turkish dialects in Turkey. Brendemoen, Bernt (2015). The Karamanlis – Turkish-speaking Greeks or Christian Turks?. Brendemoen, Bernt (2013). Orhan Pamuk and the Material World. The Author’s Use of Objects in his Novels. Brendemoen, Bernt (2012). Orhan Pamuk and the Material World. The Author's Use of Objects in his Novels. Brendemoen, Bernt (2012, 13. november). Oslo Üniversitesi'nde Türkçe dersi alanlarin yüzde 70i Norveçli. Zaman Iskandinavya. Brendemoen, Bernt (2012, 08. desember). Radioprogram om en tyrkiske dikteren Nazim Hikmet. [Radio]. NRK PT2. Brendemoen, Bernt (2012). Å oversette Orhan Pamuk. Brendemoen, Bernt (2011). Avrupalı bir türkologun gözüyle Türkolojinin sorunları. Brendemoen, Bernt (2011). Balkan ağızalarında -me/-ma’lı isim-fiilin durumu. Brendemoen, Bernt (2010). Some thoughts about lexical code-copying. Brendemoen, Bernt (2010). Uskyldighetens museum. Brendemoen, Bernt (2009). Kuzey-batı Bulgaristan Türk ağızları ile Doğu Karadeniz ağızları arasındaki benzerlikler nereden kaynaklanıyor?. Brendemoen, Bernt (2009). Transcription Texts in Topkapı Sarayı Revisited. Brendemoen, Bernt (2009). Türk Dilinin Tarihi Gelismesinin Ortaya Çıkarılması Açısından Ağız biliminin ve Transkripsyonlu Metinlerin Önemi. Brendemoen, Bernt (2008). An 18th Century Karamanlidic Codex from Soumela Monastery in Trabzon. Brendemoen, Bernt (2008). Orhan Pamuks Humanismus. Brendemoen, Bernt (2007). Orhan Pamuks humanisme. Brendemoen, Bernt (2007, 28. august). Radioprogram om Izzet Celasins bok"Svart himmel, svart hav". [Radio]. NRK. Brendemoen, Bernt (2006, 04. desember). Diverse radioprogrammer om Orhan Pamuk. [Radio]. NRK P2. Brendemoen, Bernt (2006). Orhan Pamuk: Istanbul – Byen og minnene. Brendemoen, Bernt (2004). Errors and Norms in Popular Debate. Brendemoen, Bernt (2004). The Development of Chaghatay and Ottoman as Literary Languages - Differences and Similarities. Brendemoen, Bernt (2004). Vestiges of Syntactic Code-Copying from Indo-European Languages in North East Anatolian Dialects. Brendemoen, Bernt (2003). Hva de færreste vet om Tyrkia. Brendemoen, Bernt (2003). Oversettelse av Orhan Pamuks roman "Mitt navn er Karmosin". Brendemoen, Bernt (2001). The Ottoman Imprint on the Balkans. De tyrkiske dialektene som tales i provinsen Trabzon ved den østlige Svartehavskysten er de dialektene i Anatolia som har bevart flest arkaiske trekk. Samtidig er de de dialektene som oppviser flest innovasjoner, som skyldes kopiering av trekk fra andre språk som tales i området. Arkaismene, som omfatter sentrale deler av fonologien og morfofonologien, antyder at dialektene er blitt isolert fra den generelle språkutviklingen i Anatolia atskillig (ca. 100 år) før osmanerne erobret området i 1461. Hvem de første tyrkiske innflytterne til dette fjellendte, isolerte området var, er ukjent, ettersom det ikke nevnes noen større tyrkisk bosetning av kronikørene i det bysantinske kongeriket Trabzon, som området het i senmidelalderen og frem til den tyrkiske erobringen. Da tyrkerne kom på 1300-tallet, var området befolket stort sett av en bofast gresk-talende befolkning. Sannsynligvis fordi tyrkerne lenge utgjorde en minoritet og var nødt til å lære gresk for å klare seg i lokalsamfunnet, ble mange fonologiske, syntaktiske og leksikalske trekk kopiert inn i tyrkisken fra gresk. I senere århundrer er det mulig at den tyrkiske dialekten med de iøyenfallende greske trekkene har spredt seg blant den opprinnelige gresk-talende befolkningen i forbindelse med konversjoner til Islam, slik at også et språkskifte har funnet sted. I denne forbindelse blir problematikken satt inn i en kontaktlingvistisk ramme hvor spesielt Lars Johanson "kodekopi-modell" kommer til anvendelse. Hovedmålet med avhandlingen er å analysere Trabzon-dialektene synkront og diakront og å forklare de trekkene som skiller dem fra andre anatolske dialekter. Det blir også fremsatt en hypotese om tyrkifiseringen av området. 2. bind inneholder dialekttekstene som utgjør materialet analysen i 1. bind bygger på. Disse tekstene, som er utstyrt med et rikt apparat av fotnoter og forklaringer, er tatt opp og transkribert av doktoranden, og gir samtidig et godt innblikk i fortellertradisjonen og de kulturelle særtrekkene i området. Brendemoen, Bernt (1999). Fronting and backing mechanisms in the Eastern Black Sea Dialects. Brendemoen, Bernt (1999). Orhan Pamuk og hans svarte og r¿de bok. Vowel Harmony in the Trabzon Dialects and Methodological Implications. Brendemoen, Bernt (1999). Turkish-Greek interaction in the Byzantine Empire of Trebizond. Brendemoen, Bernt (1999). Tyrkernes kulturelle p¿virkning p¿ Balkan.